The reality is that we travel so often, something as routine and automatic as knowing exactly which toothbrush in the holder is his, requires a little bit of thought. We are not wealthy jet-setters, nor trust-fund beneficiaries—we are just a married couple in their late 50s who are living the dream in the amazing City of Eternal Spring. We moved to Medellín, Colombia in May 2012…so that we could have a high-quality life, at a fraction of what it cost us back in the U.S. Our lives are so different, from what we had back home. Instead of a large home that required maintenance and upkeep, we now have a lovely three-bedroom apartment with 24-hour gated security. We can empty the refrigerator, throw the breakers, and “lock and walk” for as long as we want, without worrying about who is going to look after the place. The cost of living in the States, was getting out of hand. Since we are of the generation that has a 401(k) and not a defined-benefit pension, we had to figure out how to live on what we had saved and invested. Social Security is not going to kick in for a few more years. Neither one of us wanted to belong to the “work-until-you-drop club”. We wanted to be able to enjoy life while we were still young and healthy enough. We bought our apartment with the proceeds from the sale of our home in Maine, and now live very comfortably on $2,000 per month. This low budget lets us spend discretionary money on travel. The idea of the once-a-year vacation…is a thing of the past. Medellín has an international airport, that now acts as our hub to Central and South America. Since moving to Colombia, we have traveled to many parts of our adopted country, as well as neighboring Panama, Ecuador, Mexico, and Costa Rica. We have also been on cruises to Curacao and Aruba. Some of the benefits we’ve found of not being tied to a vacation schedule is that you can travel at off-peak times and on short notice. This allows you to take advantage of travel bargains. Our friends ask us if we have given up anything to live in Medellín. My answer is yes. We have given up shoveling snow…paying a heating bill…paying top dollar for everyday things such as restaurants, salon services, and help around the house. But we have also found so much that enhances our lives here. We have made friends with the warm, welcoming Colombian people. We have met other expats who are enjoying their lives here. We buy fresher, less expensive food at the markets and are covered by high-quality, incredibly affordable health and dental care. 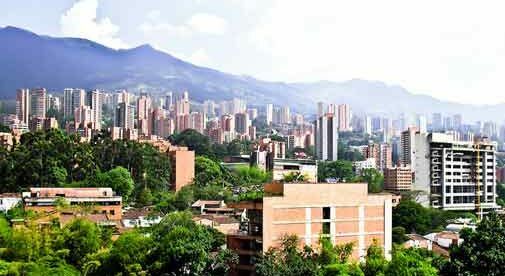 Finding a place like Medellín with a low cost of living, excellent healthcare, and First-World infrastructure has allowed us to live a life we never could have afforded back home. So, if you too want to have the freedom to experience life in a different way…then consider joining the growing number of retirees who are moving to Colombia.